That is also a strong statement, and we are not aware of any other termite company in California that is willing to share his opinion. Why is that? How can Termite Terry Pest Control get away with offering a money-back guarantee on subterranean termite treatments, when no one else will even discuss it? In this article, we will share Termite Terry’s secrets for controlling subterranean termites, and how you can keep your home or business free of these pests. 1. Drywood termites – These termites live their entire life in “dry wood”, such as in the attic, walls, and framing of a house. Drywood termites are usually treated by injecting a termiticide into wood members where there are areas of infestation, or by putting a tent over the home and fumigating it with a gas. 2. Subterranean termites – These termites are so named because they live underground. They become a problem when they work their way into structures, and start eating the wood members. Once they have eaten the wood, they will take it back down to feed their underground colony. Subterranean termites are usually treated by injecting a termiticide under the home’s foundation. One of the main problems with subterranean termites is that you usually won’t even know you have a problem with them, until it’s too late. It is because they often work inside of your home’s walls where you can’t see them. The most likely time that a homeowner will ever see a subterranean termite is when the kings and queens of the colony are swarming, during the months of February and March. This is when these termites fly out from their underground colonies, so they can find a mate, and start a family in a new location. A king or queen subterranean termite’s body is about ¼ inch long, almost black in color, and they have two pairs of wings that are almost twice as long as their body. 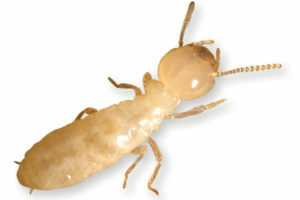 Worker termites of this specie are about ¼ inch long, white to creamy-white in color, and are wingless. They are rarely seen by homeowners, but this is the caste that does all of the damage to your home’s wood. Subterranean termite colonies are large in numbers, and may consist of many thousands of members. It is very important for you to know that there may be a dozen or more termite colonies surrounding a single structure at any given time. In other words, doing a treatment in one area may kill off one termite colony, but there may be a dozen or more colonies still working in other parts of the structure. This is why full-perimeter treatments of the entire structure are strongly recommended. Have your home carefully inspected on an annual basis. Inspection is especially important when dealing with subterranean termites, because they can be so difficult to locate. If an infestation is found, you need to take care of it quickly. We strongly recommend using a non-repellant termiticide, such as Termidor. Unlike “cheap and smelly repellent products,” Termidor is virtually odorless, and the termites will never know it is even there. Termidor is especially effective because it offers the “transfer effect”. In other words, when a termite is exposed to the product, the termite will return to the colony and spread it around to other members. This is how we can now eliminate entire colonies. access from the soil. We strongly recommend that soil treatments be performed prior to pouring of the foundation to prevent subterranean termites. Treatment of new wood members with borate solutions can also be very effective. Eliminate wood contact with the ground (e.g. by replacing wooden posts and piers with concrete ones, and by supporting wooden steps on a concrete base at least 6 inches above the ground). Regrade soil around the perimeter to ensure drainage away from the building, and maintain at least 6 inches clearance between wood siding or shingles and the ground. Eliminate sources of excess moisture, such as plumbing and roof leaks. Make sure sprinklers are adjusted and spray away from the house. Have your home inspected on an annual basis, and if a problem is spotted, take care of it quickly. Are you tired of living with termites and need an inspection? Call our office at (949) 631-7348 and we’ll schedule an inspection at your convenience.